Plovdiv, European Capital of Culture 2019, is my favourite city in Bulgaria. So John, a friend from the UK, and a regular Bansko visitor came to visit me the other weekend. Now was the time for me to show-off the delights of what Plovdiv has to offer a fellow wine lover. Plovdiv is a two hour drive from Sofia and nearly a three hour journey from Bansko. The latter being a scenic ride through the spectacular mountain scenery. Plovdiv is, in my opinion, not only a fun city to visit if you’re in Bulgaria but it makes a welcome variation if you’re after a long weekend break. By combining your trip with Sofia you have a twin-city break. Both cities offer something different, almost exotic if you’ve familiar with the well worn paths around Paris, Rome, Madrid, Budapest, London etc. But I’m with Gergana Todorova, Vinopolis’s owner, https://www.facebook.com/VinopolisPlovdiv/. She is a delightful host. The women in wine are doing great work. 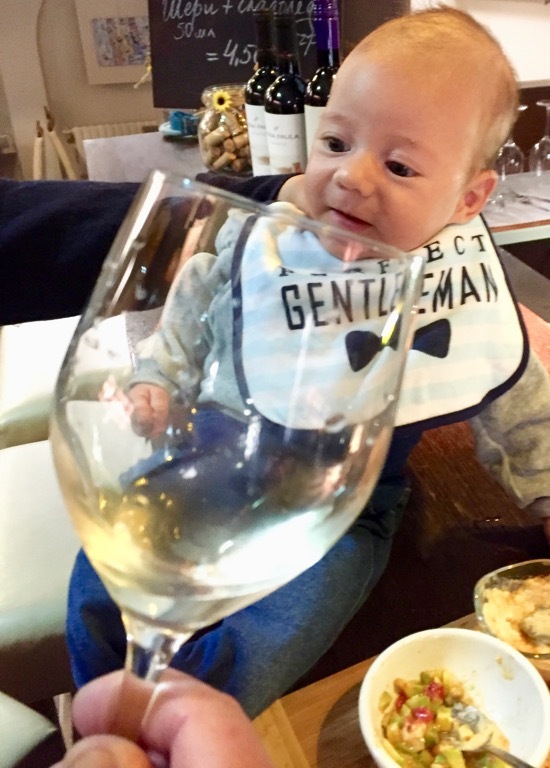 Gergana is knowledgeable and passionate about wine. Like Zina, she also runs wine tours. I had already visited Vinopolis for Zina’s birthday party and it was then that I took home a wine I thought was rather special — namely a bottle of the limited edition Maryan Sauvignon Blanc and Chardonnay. It has spent some time in oak barrels gave us a nice complex wine to appreciate whilst we were still fresh. Gergana served up a plate of tasty bites / tapas John, Ivanka, Vanya and our baby Tony were ready to move on to venue number two. A leisurely stroll through The City Park (Gardskata Gradina) to catch some sunshine. But, apart from people watching, this park is good for tree watching. It’s planted with many different species of trees and numerous seats underneath provide shade. It’s also home to the fountain, light and music show every Saturday night (around 9pm) from June till October. I go to this park every time I’m in Plovdiv. Loads of other parents with babies and young children are here. People seem happier here and I think is a testament to how good surroundings serve a common good. Then it’s on to the main pedestrianised street — up towards the mosque and we’re down the steps to Vino Culture wine bar (https://www.facebook.com/Vino-Culture-332602293543793/?fref=ts). I was at the helm again to make the first wine choice. 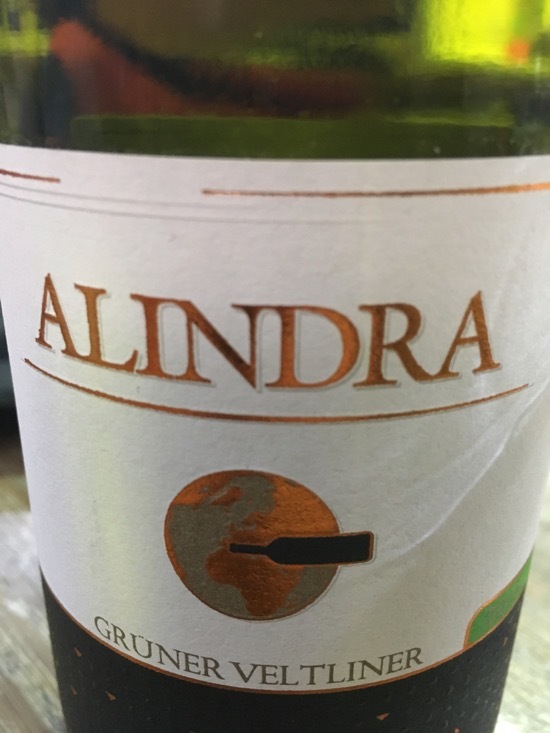 I could not resist a new firm favourite of mine; the Bulgarian white Gruner Vetliner made by Alindra. This Austrian grape is super popular with Austrians, of course. But it can be a fairly boring wine. But I’m feeling grateful that this wine was a recommendation of the vino culture team. This wine had much more depth than a usual Gruner Vetliner. Good value for money too. It is worth mentioning that on a previous visit I tasted one of my favourite reds made in Bulgaria the fabulous Chateau Copsa limited edition merlot / Cabernet Sauvignon. Usually only available direct from the vineyard, this wine is now sold out but look forward to the next vintage. 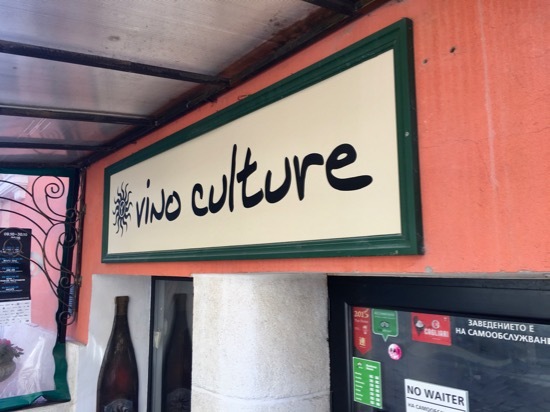 Boris and all the staff at vino culture are super friendly, knowledgeable and eager to please. Another must-visit place and the care making the tapas gave clue as to why they were so popular. A cosmopolitan atmosphere will probably await you. We saw Bulgarians, French, Swedish. Without delay, we were quick to inspect the wall of bottles. But I asked for a specific bottle of Cabernet Sauvignon Rossidi — which they had in stock but not shown. This was decanted, ready for us to once we had finished our Chateau Copsa limited edition Sauvignon Blanc. Another limited edition I hope remains as good in 2017 as it was this year. By now I was tired and left the other two to explore the bars of the Kapana district. I must add that a good alternative to Hemingways for modern Bulgarian cuisine is Pavaj, located in Plovdiv’s Kopana district. It has a short, but well chosen, list of Bulgarian wines and superb salads and modern Bulgarian dishes. Booking is essential at both restaurants. After a few calls to arrange a time for the Saturday, we fixed upon 2pm to visit Dragomir (http://www.dragomir.bg). Time to have brunch and recover from the previous day. This tour turned out to be the highlight of the weekend; a specially arranged tour of this small producer of some 80,000 per year. Whilst it is located on an unlikely area in the city, we entered with considerable excitement. What I did not reveal to my friends was that I knew the Di Vino taste winning wine. 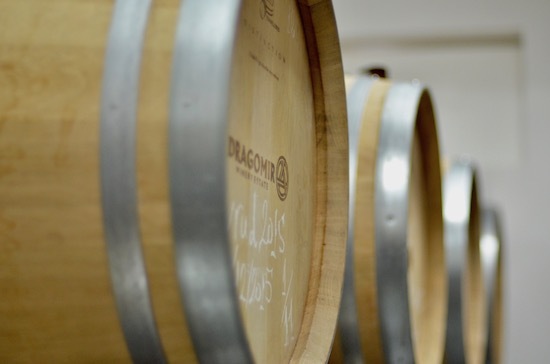 I try not to pump up expectations too high, for fear of disappointment — but I was not 100% certain how the Dragomir wine tasting would work out. It turns out that the wine maker, rather than the owner, Natalia, is giving us the tour today. The building is in a former communist era factory, completely rebuilt. Wine making requires big investment and the large new bottles machine was testament to the long term commitment this winery has. Indeed, we learnt about their expansion plans. It’s a familiar story. Confident business plans and expansion — sometimes thanks to EU money. The tour included loads of interesting facts. 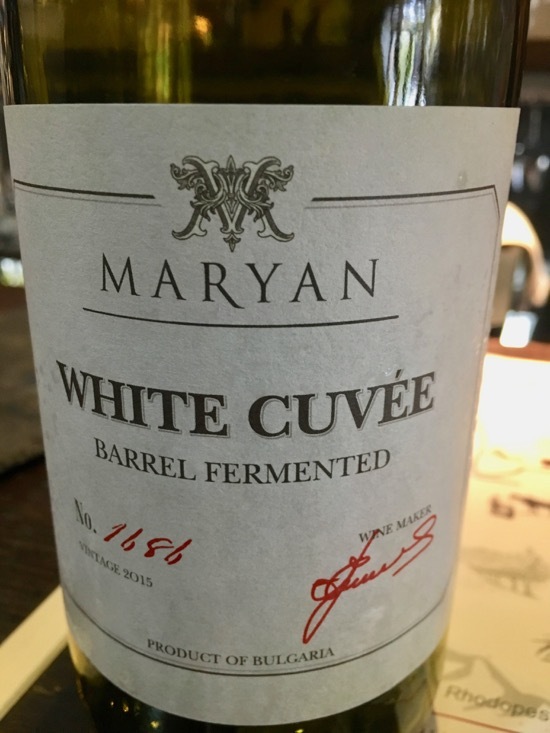 A special mention is noted for our fascination at seeing a private clients’ own new French barrel with their own blend maturing inside it and the family name plate on the outside. I think this is now on my bucket list of things to do — my very own wine. I will need some like minded friends to help me on this project because it costs around €700 for just one new French oak barrel: so expect your own wine to cost you around 33 leva per bottle — price dropping after each year of its three year life as you reuse the barrel. Each barrel will produce around 290 bottles. Back to the tour, I should mention that for the fee of 35 leva, we get to taste good wine. Almost equally as good was the wine maker; he was entertaining and knowledgeable. He had the right touch of humility with not a hint of arrogance. We laughed a lot. Good wine puts you in a good mood. 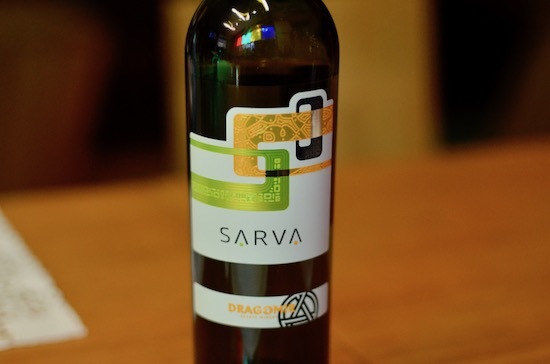 Dragomir (dragomir.bg) produce wines retailing at a minimum of 18 leva so I recommend this place to start appreciating the boutique end of Bulgarian wine. It is also located around ten minutes from the centre of Plovdiv; a cheap taxi ride away. Savra, the oak matured white, we all agreed, was excellent. 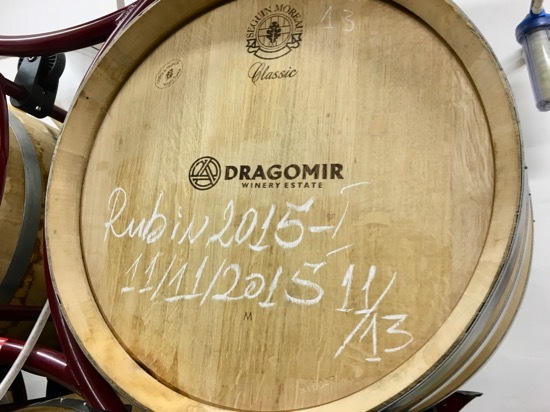 The Di Vino show winner, Rubin offered up a unique taste — a really worthy winner. We got a few bonus wines to taste that had yet to be labelled up. However, I could not resist a special request for my favourite dessert “port-style” red Mavrud 2011. Obviously I had to buy this wine before opening and, at 45v leva for a 500 ml, this is a special wine that keeps a good while after opening — maybe two months. This wine is 17.8% alcohol and is one of the best uses of Mavrud I can think of. 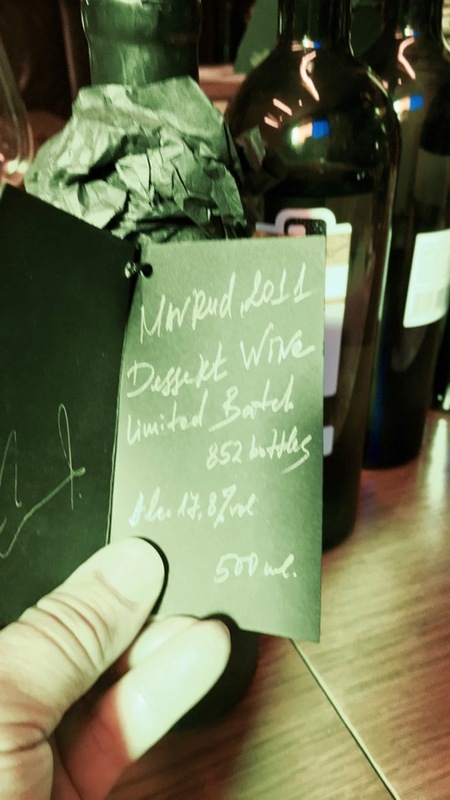 Grab a bottle while you can because only 852 bottles were made. I was keen to impress John and Ivanka — and, thankfully, it was heartily appreciated by them. And it is still giving me delight as I type this up. This wine is sweet and is to be sipped and enjoyed — stilton cheese goes well with it. A dessert wine to finish off a Christmas dinner. It was now after 4.30pm and we were starving. So we’re off to a new favourite Italian restaurant that just happens to sport an extensive and varied wine list. A new venue in town and after this second visit it has now got top place for me. 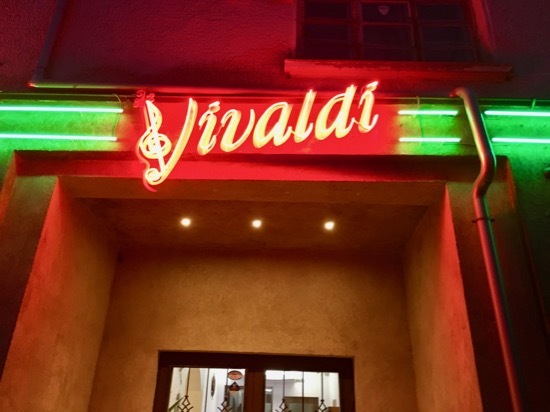 It’s 5pm now and, on entering Vivaldi, we were the only people there. But I like this first arrival tactic. It worked a treat here, because the attention we were offered from the three staff, and chef, was wonderful. We were recommended a whole seas bass to be shared between the three of us. 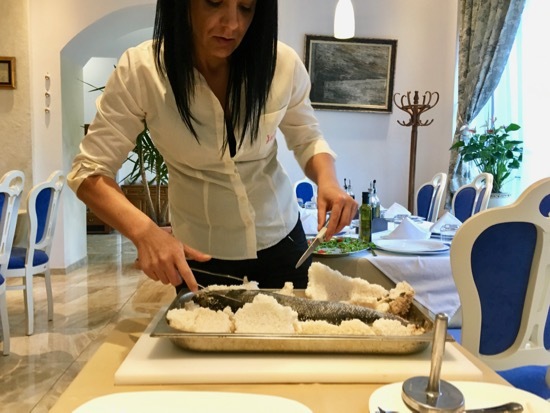 And they offered to cook it with the super cool method of encasing the fish in salt so it keeps super moist. There was immediate and unanimous agreement this was going to be the dish for us all. After they brought out the whole sea bass for our inspection, it was time to settle into an Italian Prosecco. A sparkler was needed to revive the slightly jaded palate at this stage in the proceedings. John remarked this one (awaiting to edit with the name of it) was the best he had ever tasted. I would put it up there with the, more expensive, Botega Gold. A decent Sauvignon Blanc from Midilidare and we were super stoked from the day’s proceedings. So many good wines over two days accompanied by friendly service too. The changes in Bulgaria are being felt and the wine and food sector is pushing ahead in quality. But it is in Plovdiv that I feel the pace of change is the fastest right now. Like so many second cities, it has a less rushed feel to it. 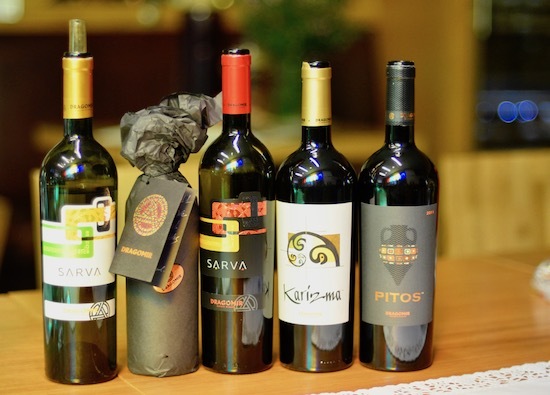 High quality cuisine and fine wine has been a reality for many years in Bulgaria. I think that the difference now is that the new generation of wine growers, business owners, restauranteurs are bringing with them knowledge, passion and customer service. This combination can be felt. And proves it’s not just about the money. I have to add that many of the wines we enjoyed were limited edition wines. 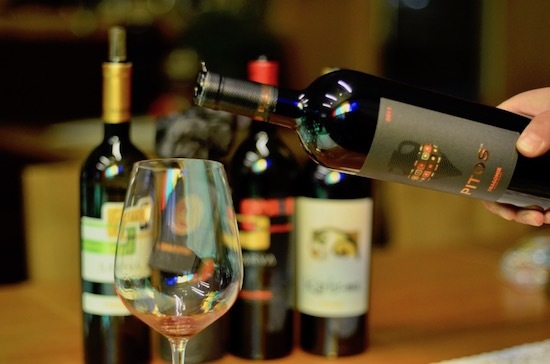 Because of the small production quantity, some of these wines often are not produced in sufficient amounts to be entered into wine competitions. The upside to this is that finding them feels better. Whilst I don’t have any, I do feel I have some inside knowledge. Sometimes just one or two barrels are produced. Maybe it’s like the owners barrel that we saw at Dragomir — owners own brews. And more power to them for doing so. Downsides: I’m really struggling to think of any apart from the usual ones that apply to anywhere in Bulgaria. If you’re drinking wine and walking then be warned that the pavements require you to walk looking at your feet. Amongst the most listened podcasts is the one recorded in Plovdiv talking about places to visit and how to enjoy Plovdiv with fellow BIMA (Bulgarian Independent Media Alliance) member, Clive Leviev-Sawyer. 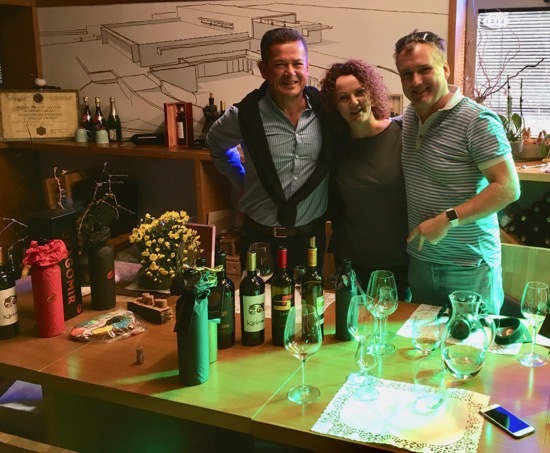 Watch out for my new top 10 wines of Bulgaria podcast. It will be recorded direct from Di Vino wine exhibition in Sofia. 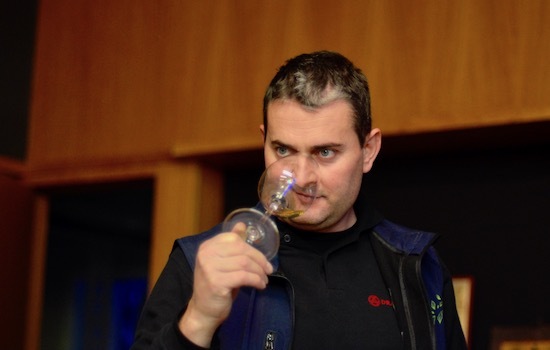 Here was last year’s show with Mitko (Decanter magazine wine judge). This year’s show runs from 18th to 20th November in Sofia’s NDK.